Kills the Queen & the Mound. No Mixing. Dead Ants in 24 Hours. No Watering Necessary. Use on Lawns & Other Turf Areas Such as Recreational Areas, Rangeland, Permanent Pastures, Ornamentals, Landscapes, Greenhouses & Most Crops including, but not limited to tree nuts, citrus, stone fruit, tree fruits soybeans and vegetables. Contains a bait that attracts foraging fire ants and is redily taken back into the nest as food for the colony. Fire ants that consume the bait will appear sick and lethargic within 12-24 hours. 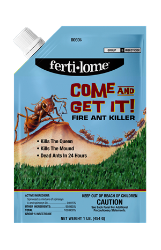 Dead ants will frequently be seen near mounds 24-36 hours after application. Mound Rate – Mounds less than 15 inches in diameter use 4 tbsp per mound evenly distributed over the mound and extended out about two feet surrounding the mound.